Flannel is a woven fabric usually made from cotton, wool or a blend of fibers, characterized by its slightly raised nap and soft hand. 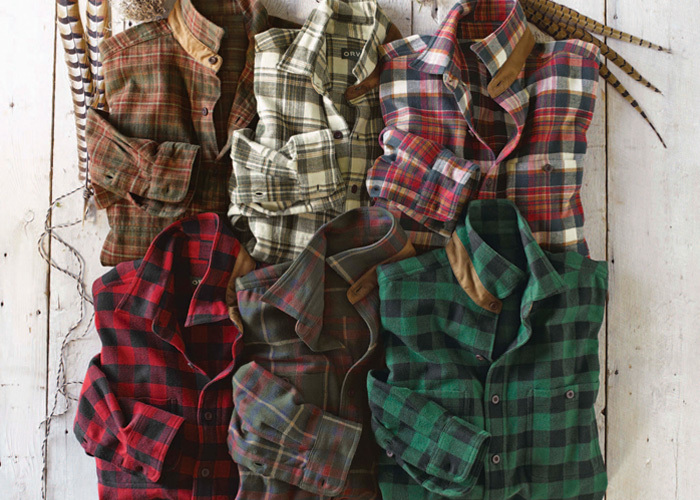 Durable, warm and comfortable, flannel is routinely used in the production of sheets, blankets, and apparel such as sleepwear and long-sleeve shirts; the latter having become an iconic symbol of rugged outdoorsiness. Flannel is commonly thought to be synonymous with plaid—an understandable but erroneous association between the fabric and the popular tartan pattern frequently used for finished flannel products. Flannel originated among 17th century farmers in Wales where it was called ‘gwlanen’, a Welsh word signifying a soft, woven material. Welsh farmers originally crafted flannel shirts from sheep’s wool to protect themselves from the elements during their damp, windy winters. Eventually, the fabric’s name changed to flannel—possibly derived from the Old French word ‘flaine’, meaning blanket—and it became popular throughout Europe as its production scaled up during the Industrial Revolution. As an interesting aside, the word ‘flannel’ has long had additional meanings in Great Britain. For example, some use it interchangeably with the word facecloth, which makes sense given that facecloths used to be made out of flannel before the advent of terrycloth. ‘White flannels’ are trousers worn when playing cricket. The word ‘flannel’ is also a slang term used to describe evasive talk, perhaps related to the expression “pulling the wool over someone’s eyes”. Flannel, widely appreciated as an affordable, tough, and utilitarian material, eventually made its way to America where it was used to create cozy long underwear, or “long johns”, to keep soldiers warm during the Civil War. Later, flannel clothing was adopted by railroad construction workers and loggers on the western frontier—which is how it came to symbolize the rugged American pioneer spirit. In fact, modern-day depictions of that iconic giant lumberjack of American folklore, Paul Bunyan, often show him clad in a red tartan flannel shirt. Fast forward to the 1990’s when the plaid flannel shirt became the uniform of the counterculture grunge rock movement and then ‘hipsters’ a few years later—undoubtedly related to the shirt’s image, embodying strength and independence. Though the flannel shirt may never shake its historical baggage, or its close association with tartan print, these days the fabric remains more popular than ever, with both men and women of all ages, because it’s warm, soft, comfortable, and durable—the original qualities that its early adopters celebrated in the first place. Attractive, well-made flannel clothing, including trousers, skirts, jackets, and, of course, shirts will always be favorite wardrobe go-to items when there’s a nip in the air. This entry was posted in UKNews and tagged Clothing on February 21, 2018 by Aaron Blank. Thanks for the published entry! I’d like to let you know that flannel is a warm, very cozy and comfortable fabric which is used for making shirts. Its durability has been proved one hundred times! Note that http://bigessaywriter.com/blog/page/6 is a good resource to follow!